Micro-CT (micro-computed tomography) is a growing technology with many useful applications in geoscience. 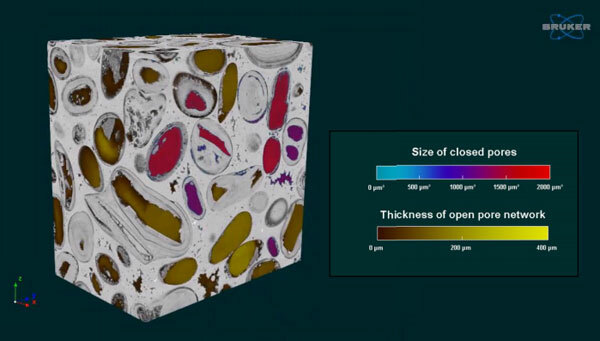 As a non-destructive, high-resolution 3D imaging and analysis method, micro-CT provides useful information on the porosity, micro-structure and composition of geological samples. This post provides an overview of the what’s possible with micro-CT, with examples and the advantages of the technique, including multi-scale imaging and imaging of dynamic processes. Micro-CT is a non-destructive 3D imaging and analysis method, for studying the internal structure of all types of samples, with diameters from 1 mm to 20cm and full drill cores. Take virtual slices through objects and build stacks of slices for 3D volume rendering. 3D analysis of shape and morphometries, including grains, sedimentary patterns, fossils, etc. 3D internal imaging is complementary to other analytical methods,including optical / electron microscopy, XRF and XRD. 2 mm microplug, 1 µm resolution, measured with the Bruker SkyScan 2211. Rocks can be segmented into binary pores versus solid models. Access 3D information about the properties of the pore network, including its local thickness. Based on the 3D imaging, transport properties can be modelled directly. This provides information about permeability, multiphase flow properties, capillary pressure curves, resistivity index, etc. For conventional reservoirs, simulated values are very close to laboratory measured values. An increasing number of methods are becoming available for unconventional reservoirs. 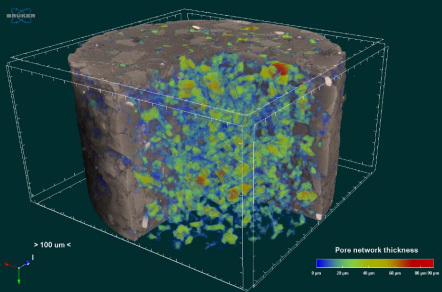 Analysing porosity with the Bruker SkyScan 2211 – measure the size of closed pores and the thickness of open pore networks. If there is sufficient contrast, rocks can be segmented into different mineral fractions. This is useful when analysing ores. Gold deposit: 9 µm pixel size, 29 mins scan time, measured with the Bruker SkyScan 1275. Analyse large samples at low resolution, and small samples at high resolution. Very high resolution can be achieved on good sample sizes. You can also select regions of interest rather than scanning the whole sample, to save time and focus on just the data you need. There is no physical sub-sampling. The data acquired from micro-CT can also add value to other analytical techniques, including micro-XRF, XRD and optical/electron microscopy. Data can be overlaid to create 3D mineral maps and more. 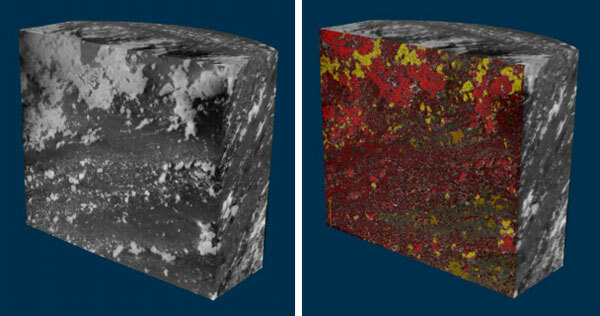 Drill core – Left: Micro-XRF element map; Middle: Micro-CT scan; Right: Overlaid data from both instruments. Drill core – 3D alignment of micro-CT and micro-XRF data. 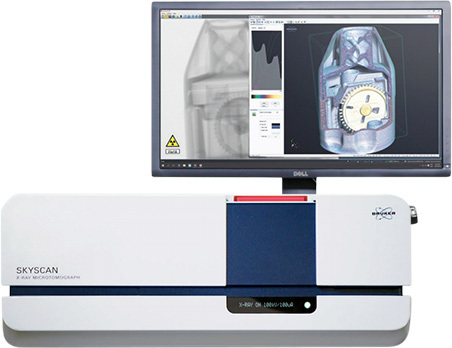 The Bruker micro-CT range includes benchtop scanners up to large, advanced systems with unmatched specifications. The newest in the range is the SkyScan 1275 self-optimising scanner, for automated imaging at the press of a single button. Image reconstruction is extremely fast, making it an extremely convenient way to add micro-CT to your lab.